How do you cope with tension, bitter cold and long hours of darkness if you are a pro-EU demonstrator on the streets of Kiev? For many Ukrainian protesters the answer is to sing and dance. Thousands took to the streets in late November after the government said it was putting European integration efforts on hold, in favour of closer ties to Russia. A deal with Moscow announced this week delivered a further blow to the protesters - yet many remain camped out in the Ukrainian capital, braving the sub-zero cold. There has been an explosion of creativity generated by the stand-off in Kiev. The "Euromaidan" protest movement has a folklore of its own, complete with heroes and villains. In Kiev's Independence Square, the focal point of the protests, a stage has been set up where performers entertain demonstrators well into the small hours. Rock band Okean Elzy is particularly popular. "Rise up," run the lyrics to one of their songs, "your land is waiting: do we go East or West?" Several times during the night, Ruslana, the 2004 Eurovision Song Contest winner for Ukraine, takes to the stage to lead the crowds singing Ukraine's national anthem. She was an active supporter of the 2004 pro-Western Orange Revolution, won a seat in parliament, and openly backs jailed former prime minister Yulia Tymoshenko. From the same stage, activists also perform ditties set to Ukrainian folk tunes, mocking top government officials as well as Russia's President Vladimir Putin. 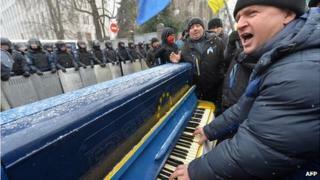 A piano was brought to one barricade, and protesters played folk songs to entertain themselves and riot police alike. Journalist Bohdan Kutiepov's accordion rendition of Bomfunk MC's "Freestyler" has also proved popular. The song contains few words but features the names of top government officials - and mocks Prime Minister Mykola Azarov for his less than fluent spoken Ukrainian. When not on accordion duties, Kutiepov is a regular host of The Night Watch, a live programme broadcast from protest locations in Kiev by the independent online station Hromadske TV. Another journalist, Michael Shchur, authored a popular song used to rally opponents of President Viktor Yanukovych. In it, he tells the country's strongman leader that what's going on in Ukraine under his rule is "too much". In the depths of winter the Euromaidan protesters need all the motivation they can get to keep going. So at night, when the mercury plummets, the warmth of a group sing-song replaces the comfort of a warm bed.